I am excited to feature some new stamps from Darkroom Door today. The tall flowers are from the new ‘Tall Flowers’ set and the background flowers are from the delightful ‘Nature Walk’ set. I am a guest over on the Darkroom Door blog today, if you haven’t visited you definitely should check out all the inspiration shared there. My first card features a cold pressed watercolour panel filled with one of the stamps from ‘nature walk’ set inked in iced spruce and stormy sky distress inks. I diluted the ink with a spritz of water and stamped first, second and third generation impressions. 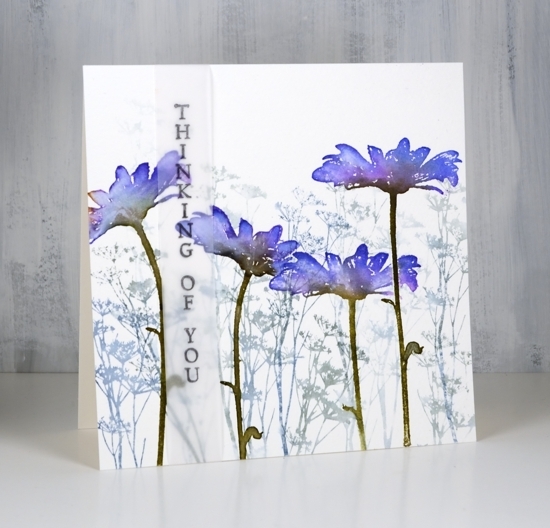 Over the top I stamped the tall daisy from ‘tall flowers’ four times with wilted violet, blueprint sketch and forest moss distress inks. Because the stems are long and thin I was able to orient them in different directions. I used a mask a couple of times to overlap the daisies. Once stamped I blended the colours with a paintbrush and water. 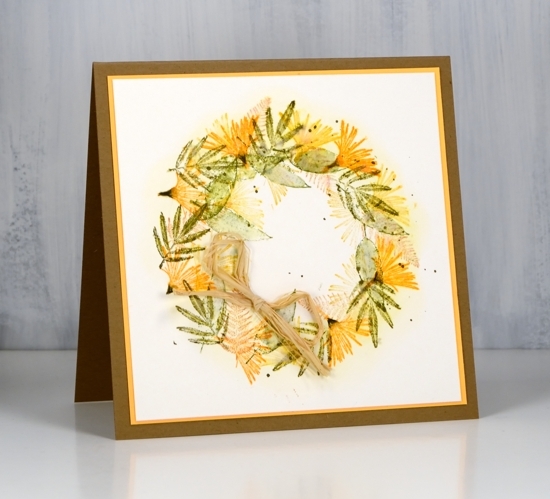 I used a similar process to create the orange toned daisy card but this time I did the background foliage after the foreground flowers by using stamped and cut out masks. 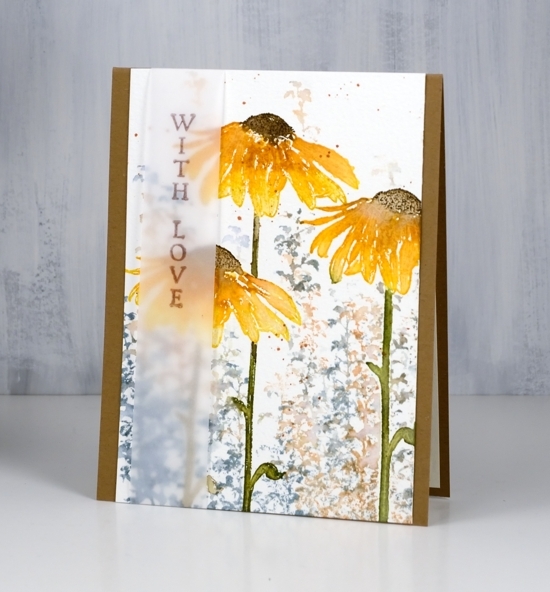 The daisies are stamped in peeled paint and fossilized amber distress inks. I added extra colours one at a time with spiced marmalade marker, rusty hinge marker close to flower centre and finally ground espresso marker on the centre of the flower. 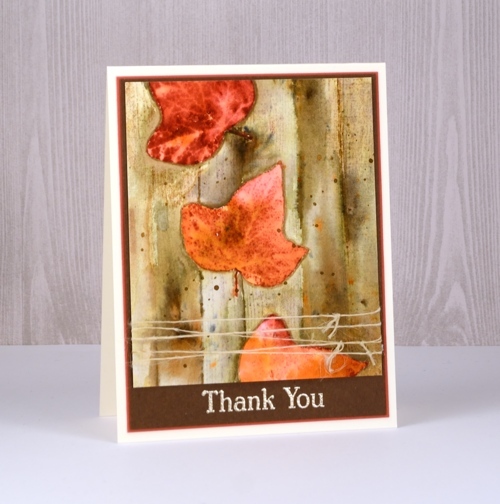 I blended the inks with water then after it was dry stamped the centres again to add some texture back in. 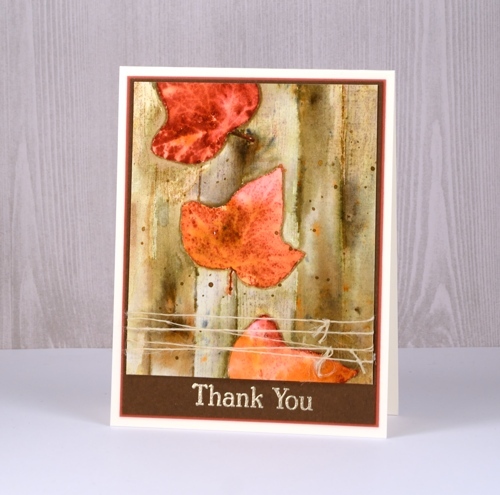 The background stamping is another stamp from the DD ‘nature walk’ set stamped with weathered wood and tea dye distress inks. I added some splatter because, well, why not! 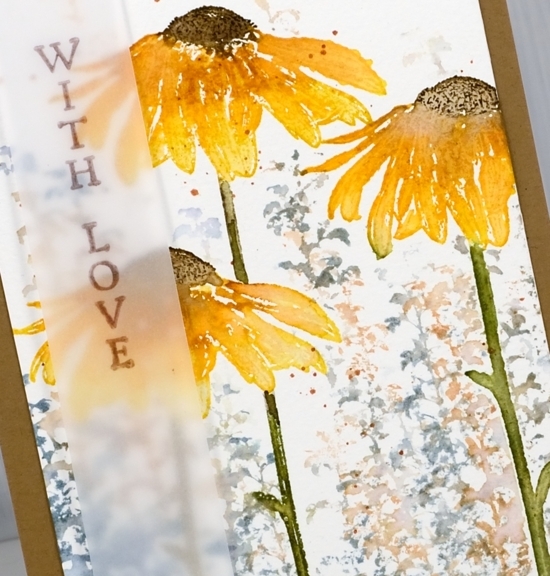 On both the daisy cards I decided to add the sentiment on a vellum strip. I liked the floral scenes too much to stamp words over them so the vellum seemed like a subtle way to do it. The recipient could even snip the sentiment off and have a picture to display if they wanted to. For this tall thin panel I used the kraft card base to frame it on two sides. The last card is a little different; I used the small flower from ‘tall flowers’ and some little leaves from ‘leaves’ set to make a wreath. To guide my stamping I traced a circle onto my watercolour panel. I sponged fossilized amber distress ink around circle then erased the pencil line. With the sponging as a guide, I stamped the small flower heads from ‘Tall Flowers’ set round the circle in carved pumpkin ink, holding the stamp so only flower(not stem) was inked and stamped. I repeated the process with small leaves and ferns from ‘Leaves’ set in fossilized amber, peeled paint, forest moss and tea dye distress inks. 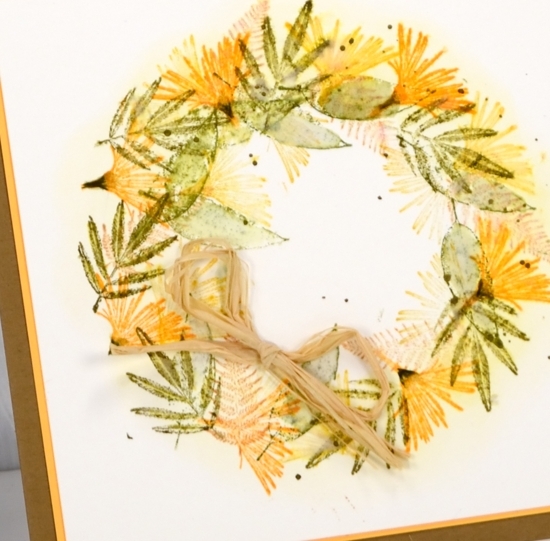 You know I splattered forest moss ink over wreath because that’s what I do then matted the panel in orange cardstock, attached to a kraft card base and added a raffia bow. 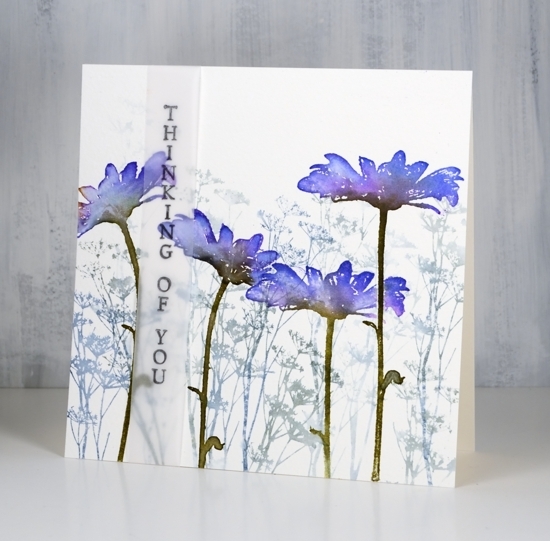 I loved creating with these beautiful tall flower stamps and couldn’t help myself from using the ‘nature walk’ stamps again because they work so well together! Darkroom Door has a wonderful range of stencils that co-ordinate with quite a few of their stamps. 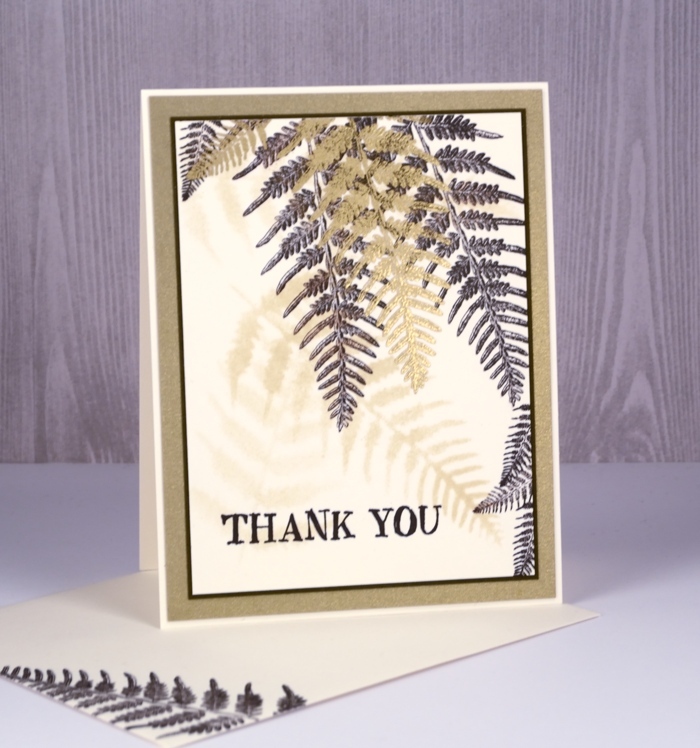 I used the ferns stencil to create a soft background for the fern stamps from the ‘leaves’ set. I used neenah natural white paper and sponged with the antique linen distress ink through the stencil. 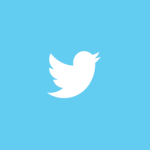 I did it three times to create a few soft background images. Over the top I stamped both the large and small ferns from the leaves set in stazon ganache ink. I have been pulling out the stazon inks whenever I’m working with the fine details of some of the Darkroom Door stamps. Initially I bought the stazon inks to pair up with my alcohol ink backgrounds but they are very good for fine detail stamping. 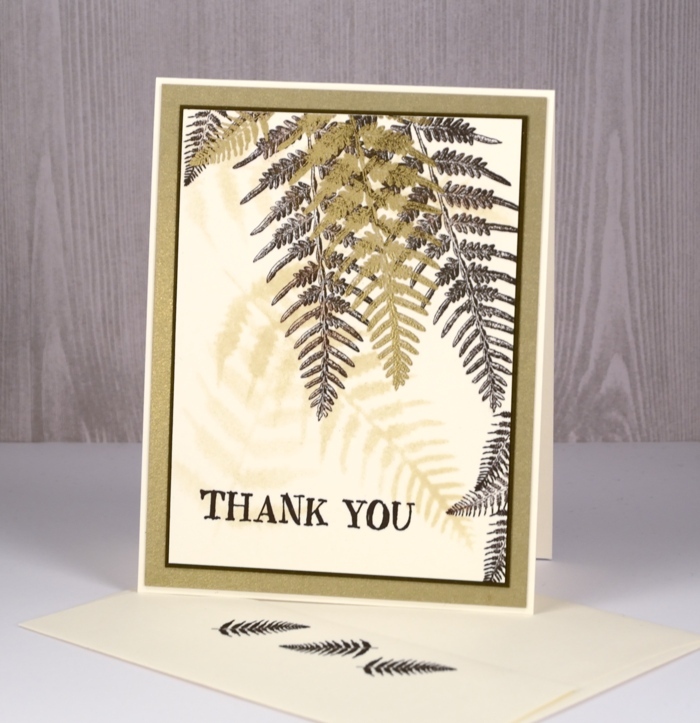 Once I had stamped quite a few ferns in ganache ink I stamped one large fern and one small in versamark then embossed them in gold. 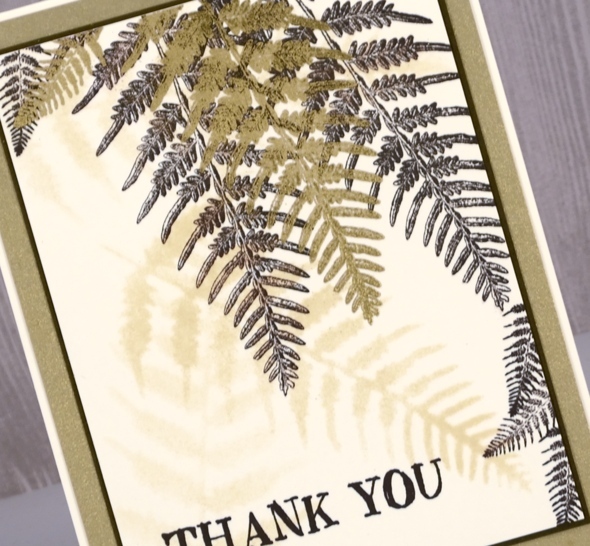 The sentiment and ferns on the envelope are stamped in stazon ganache. I added a narrow dark brown mat and a wider brushed gold mat also and attached it all to a natural white card base. 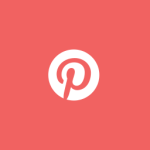 It is nice to be back with my family in Canada, back in my workroom and back on my blog. 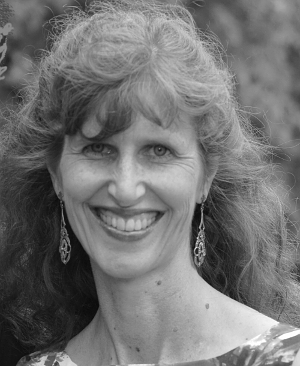 Before I talk about today’s card, however, I would like to thank you, my blog readers for the outpouring of kindness I received in the comment section last month when I let you know my mother had died. I read every message; my dad did also and we deeply appreciate the time you took and the words you wrote to me and my family. I am grateful for your prayers, your thoughts and your words of understanding. 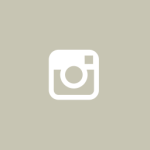 Many of you shared that you have been through the same sadness. All you of you wrote to me with such kindness and concern that I feel very blessed to be part of such a caring community. 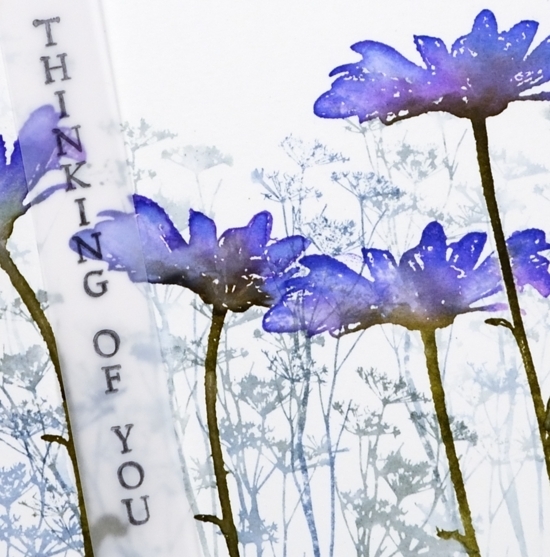 I waited until I returned home to respond as I wanted to make a thank you card to post here on the blog along with my heartfelt thanks. I’m sorry it isn’t a real life card turning up in your mail box but it is made especially for you all the same. I recognised many names but there were many others who commented for the first time just to extend their sympathy to me; thank you all for taking the time. 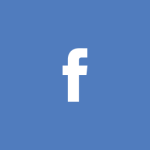 My father left his thanks to you, my blog readers, in a comment on that post; it is towards the end of the comments section if you care to pop back and read it. While I was in Australia I enjoyed some warm weather extending my summer by a few weeks. When I returned to Canada I was surprised to find many trees with leaves still changing colour and a yard full of leaves still to be collected. My first full day back was delightfully warm – sandals weather actually – but that seems to be over now; the temperatures have fallen along with a whole lot of rain! My card is inspired by the season here at home and stamped with Darkroom Door stamps. 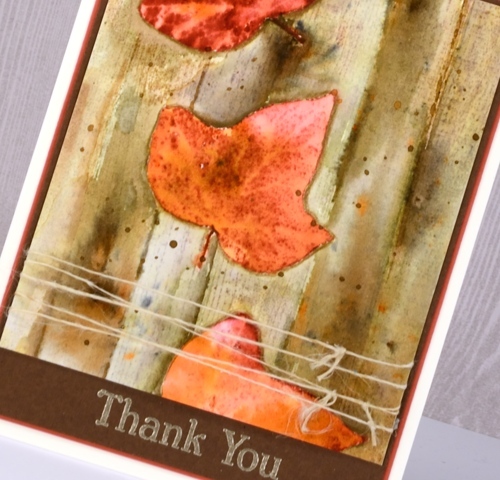 I used a leaf from the Leaves set and the woodgrain background stamp. I stamped the leaf three times on hot pressed watercolour paper without re-inking in between, that way I was able to get a dark red, medium and a pale red impression (inks listed below). I stamped the leaf on post-it notes also and cut them out to use as masks. With masks in place I inked the woodgrain stamp in three shades of brown and stamped over the leaves. With all the stamping done I switched to painting using a small watercolour brush and some water to blend the distress inks. As I blended I sprinkled some brusho into the leaves and later onto the woodgrain to add some extra shades of colour and appearance of texture. The panel is matted with two different browns and the sentiment stamped then embossed with platinum embossing powder. Its the first time I’ve used platinum and it seems to have co-ordinated well with the brown tones. I hope its one of those magical tones that looks good with a whole range of colours. I finished off the panel by wrapping some vintage French twine around then attached it all to a natural cardbase. 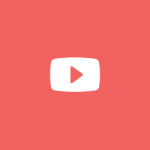 Thank you, again for your kindness; I read through your comments again as I wrote this post and I’m sure will I return to them in the future.